They say lightning never strikes twice. Well, how about asteroids? A violent collision with a space rock, like the one that doomed the dinosaurs, may have also caused our planet's greatest mass extinction 250 million years ago. February 23, 2001 -- New findings provide evidence that Earth's most severe mass extinction -- an event 250 million years ago that wiped out 90 percent of the life on Earth -- was triggered by a collision with a comet or asteroid. Over 90 percent of all marine species and 70 percent of land vertebrates perished as a result, according to the NASA-funded research team, led by Dr. Luann Becker of the University of Washington (UW), Seattle. The team's findings will be published in today's issue of the journal Science. The collision wasn't directly responsible for the extinction, but rather triggered a series of events, such as massive volcanism and changes in ocean oxygen, sea level and climate. That in turn led to extinctions on a wholesale level, according to the team. 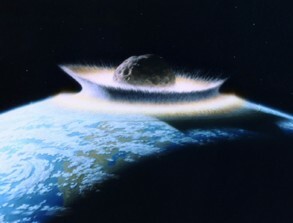 Above: This artist's rendition shows how an asteroid collision might appear at the moment of impact, although the space rock in this image is considerably larger than the one Becker's team believes hit 250 million years ago. "If the species cannot adjust, they perish. It's a survival-of-the-fittest sort of thing," said Becker. "To knock out 90 percent of organisms, you've got to attack them on more than one front." Scientists don't know the site of the impact 250 million years ago, when all Earth's land formed a supercontinent called Pangea. 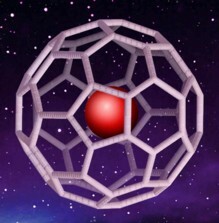 However, the space body left a calling card -- complex carbon molecules called buckminsterfullerenes, or Buckyballs, with the noble gases helium and argon trapped inside the caged structure. Fullerenes, which contain at least 60 carbon atoms and have a structure resembling a soccer ball or a geodesic dome, are named for Buckminster Fuller, inventor of the geodesic dome. The researchers know these particular Buckyballs are extraterrestrial because the noble gases trapped inside have an unusual ratio of isotopes, atoms whose nuclei have the same number of protons but different numbers of neutrons. Terrestrial helium is mostly helium-4 (two neutrons and two protons), while extraterrestrial helium is enriched with helium-3 (one neutron and two protons). "These things form in carbon stars. That's what's exciting about finding fullerenes as a tracer," Becker said. The extreme temperatures and gas pressures in carbon stars are perhaps the only way extraterrestrial noble gases could be forced inside a fullerene, she explained. Above: The most common Buckyball (C60) has a shape consisting of hexagons and pentagons arranged in the same pattern found on most soccer balls. Researchers found unusual isotopes of helium trapped in this "cage" that indicate they came from outer space. These gas-laden fullerenes were formed outside the Solar System, and their concentration in the sedimentary layer at the boundary of the Permian and Triassic periods means they were delivered by comets or asteroids. The researchers estimate the comet or asteroid was roughly 6 to 12 kilometers across, or about the same size as the asteroid believed responsible for wiping out the dinosaurs 65 million years ago. The telltale fullerenes containing helium and argon were extracted from sites where the Permian-Triassic boundary layer had been exposed in Japan, China and Hungary. The evidence was not as strong from the Hungary site, but the China and Japan samples bear strong evidence, Becker said. The team's work was made more difficult because there are few 250 million-year-old rocks left on Earth. Most rocks that old have been recycled through the planet's tectonic processes. "It took us two years to do this research, to try to narrow it down enough so that we could see this fullerene signature," Becker said. Above: This new evidence incriminates cosmic collisions in a second major mass extinction. Scientists believe another collision wiped out the dinosaurs 65 million years ago -- the crater from this collision can still be seen from space near the Yucatan Peninsula in Mexico. Scientists have long known of the mass extinction 250 million years ago, since many fossils below the boundary -- such as trilobites, which once numbered more than 15,000 species -- diminish sharply close to the boundary and are not found above it. There also is strong evidence suggesting the extinction happened very rapidly, on the order of 8,000 to 100,000 years, which the latest research supports. Previously, scientists thought that any asteroid or comet collision would leave strong evidence of the element iridium, the signal found in the sedimentary layer from the time of the dinosaur extinction. Iridium was found at the Permian-Triassic boundary, but not nearly in the concentration as from the dinosaur extinction. Becker believes that difference is because the two space bodies that slammed into Earth had different compositions. Members of the research team are Becker; Robert Poreda and Andrew Hunt from the University of Rochester, NY; Ted Bunch of the NASA's Ames Research Center, Moffett Field, CA; and Michael Rampino of New York University and NASA's Goddard Institute of Space Sciences, New York. Funding for the research was provided by NASA's Astrobiology and Cosmochemistry programs and the National Science Foundation. A Close Encounter with a Space Rock -- Science@NASA article: Today a half-km asteroid is passing by the Earth 12 times farther from our planet than the Moon. Scientists say it's an unusually good opportunity to study a near-Earth object. Trick or Treat: It's Toutatis! -- Science@NASA article: NASA scientists are monitoring a large near-Earth asteroid that tumbled past our planet on Halloween 2000.